HP desktop running Vista, no obvious fake AV malware but has google redirects and weird audio playing, like ads. Could not kill with MBAM, Spybot, etc or in safemode. 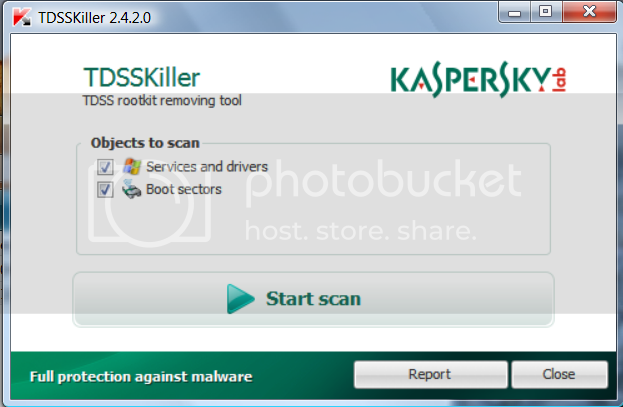 Used Kaspersky Rescue Disk 10 and it found TDSS.e virus and claimed it was bad volsnap.sys. Did recommended delete and then reboot. Now getting 0x7b on all boot attempts (regular, safemode, last known, vga,etc). Tried repair in recovery console but after 10 minutes it reported could not do repair. Reading additional details said "bad driver". Tried to copy good volsnap.sys from several locations to windows/system32/drivers but still BSOD 0x7b. There are restore points but each attempt comes back with "catastrophic failure 0x8000ffff". Ran memtest86+ two passes, ran chkdsk/r with no errors, sfc scannow with no errors, ran SMART tests in BIOS with no errors. Cannot get past BSOD 0x7b, can only get into recovery console but repair or restore fails. I dont think this is a hardware failure, but cant tell if there is still a virus or if the volsnap.sys removal caused something else to go wrong. I have been hearing about this kind of failure very recently but dont have enough to go on to fix. Can anyone help ? Thank you. Please post your logs, don't attach them unless stated. Please read my posts carefully and if you have any questions ask. Stay with this topic until I tell you that your system is clean. Malware can still be on your system even if you don't notice it. Ok, will do now and get back to you shortly. Thank you. with the error: NOT A VALID FIX FILE. Is there something missing or did I possibly do something wrong ? 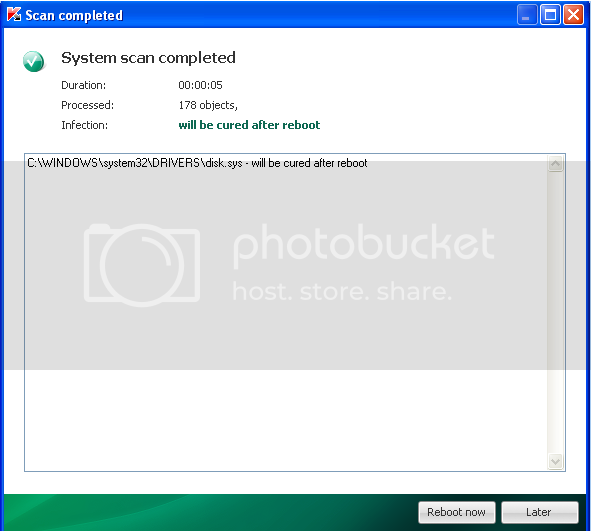 Can you copy and paste the contents of the file to the custom scans box and click on run scan? Ok, I figured out how to move the scan.txt around, here is the OTL output. Thank you for helping. Registry value HKEY_USERS\John_ON_C\Software\Microsoft\Windows\CurrentVersion\Run\\NuHveRXdmtu deleted successfully. Please post at http://forum.kaspers...howtopic=210216 that you are already receiving help for this issue. It is a waste of time to be helped at two different forums. Fixing the Master Boot Record (MBR) would remove the ability to boot into the recovery partition. The TDSS infection infects the MBR. Let's try putting the infected file back to see if you can boot into your computer and then solve the issue from there. I have never tired this before, I'm not sure if it will work. Added message at kaspersky that I was geting help here. Applied fix, let it run until done, shut down and restarted machine. Still getting 0x7b stop moments after the windows loading progress bar start to scroll accross the screen. Just like before. Edited by NYJIMBO, 13 June 2011 - 01:39 PM. Try and reboot normally into your computer. Function Failed. Error 21: The device is not ready. I stopped at that point, leaving the fixmbr open at the prompt. edit: would having a USB stick on the machine affect this ?. One is in there now for possible file copy needs. Edited by NYJIMBO, 13 June 2011 - 02:03 PM. The usb may be affecting it, I don't know. Try turning off the computer, unplugging the flash drive and try it again. 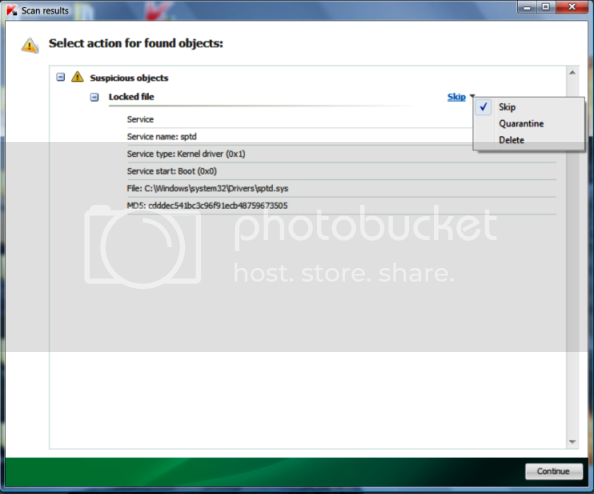 Ok, after reboot and attempt to pick up from mbr commands still got the same error code. as sata 4 inside the machine. There is only 1 hd and it is 160gb. Shouold I apply the MBRFIX command to this drive number ?